HWMO's information booth was a hub for wildfire curricula information. HWMO takes pride in the environmental education programs we share statewide, placing heavy emphasis on the “take action” part of the above definition. We hope through our educational programs that people are moved to action to become wildfire ready. 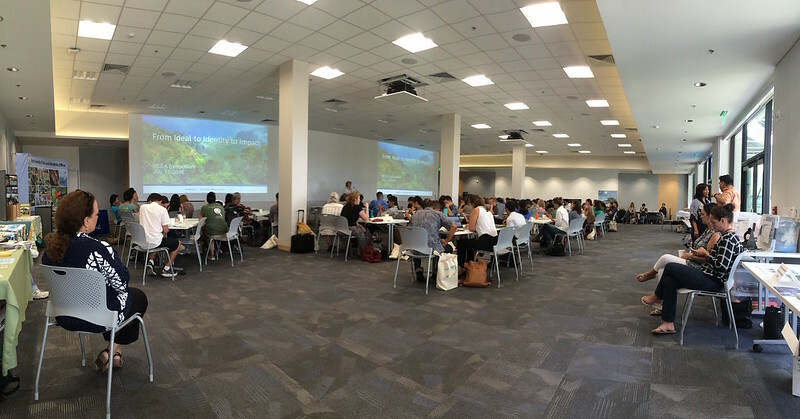 Pablo Beimler, Community Outreach Coordinator for HWMO, flew to Oahu for the Hawaii Environmental Education Alliance (HEEA) Symposium on July 13th at the Hawaii Pacific University downtown campus at Aloha Tower in Honolulu. The symposium was a gathering place for environmental educators from across the islands to share lessons learned, support innovative teaching methods, and create new networks. * Branding for Good: Lessons learned on branding as a non-profit, especially relevant for our organization. * ARTSEED - A Honolulu Museum of Art program that integrates art and science in a real world context. Students’ artwork were featured in the new editions of the Oahu Botanical Field Guide. * MECO - Engaging with Local Government - A presentation by Kuhea Asiu who shared best practices for getting involved in the political process and how to “infiltrate” to increase environmental action. * Inquiry-Based Field Science - HWMO’s former Planning Assistant, Ilene Grossman, shared about her new efforts of bringing science to the hands of keiki and the community. * Waimea’s own Seri Niimi-Burch shared success stories of Foodcorps from across the islands. An environmental educator stops by to pick up Native Firewise Plant bookmarks. Pablo held an informational booth with a poster board displaying the diverse environmental education methods HWMO uses to promote awareness and catalyze action among Hawaii residents and youth. He made great connections throughout the day and shared HWMO’s curricula with various educators.